Acorn squash is one of my favorite autumn foods. Their green skin hides a heart of gold which pairs perfectly with salty, sweet and spicy flavors. From brown sugar and chili flakes to fresh herbs and toasted nuts, acorn squash is an amazingly versatile gourd, similar to butternut squash, with a creamy texture and subtle, nutty flavor. Easy to bake, roast, steam or grill, a small acorn squash easily serves one as an entree or two as a side, making it perfect for entertaining small parties! Here are 5 of my favorite gluten free acorn squash recipes, begging to make their way onto your Thanksgiving table! 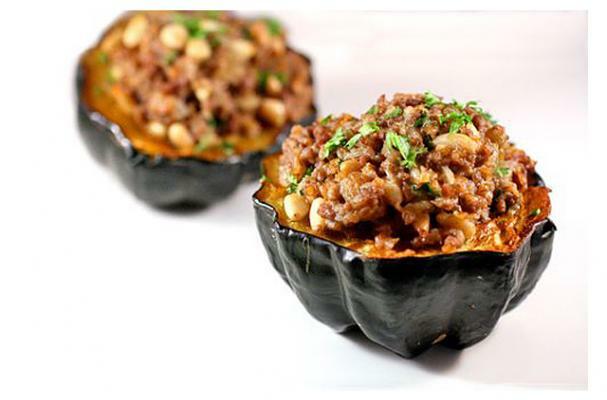 Roasted acorn squash with a super fragrant filling of cinnamon, golden raisins and pine nuts! Be sure to substitute wild rice or quinoa for the bulgur. Milk/dairy free. A little sweet and incredibly creamy, this side dish is an elegant addition to your Thanksgiving table! Vegetarian. An excellent side dish, starter or entree, this simple stuffed squash is perfect for entertaining! Seriously, nothing could be easier than this addictively delicious side or starter! Milk/dairy free & vegan/vegetarian. This amazingly aromatic dish is elegant and delicious! With a mouth-watering spicy-sweet filling and packed with healthy ingredients, this is definitely a must-try! Milk/dairy free & vegan/vegetarian.